Studio E is probably the smallest recording studio in the Benelux. The size doesn’t refer to the quality, but it makes it possible to record at a very cheap rate! 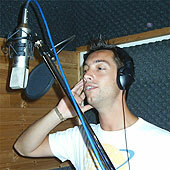 The quality is determined by the professional recording equipment and 20 years of experience in music. Find out what the possibilities are to put your talent on CD. Finally your musical genius, your virtuosity, your amazing lyric or your fabulous song can be recorded for life. Make your dream come true and record your own CD, with professional support at a low price! Studio E Music Productions is a small recording studio with high quality material situated in Belgium: this guarantees a high music quality result for a low price.